Since the inception of the Castle-Crown Wilderness Coalition (CCWC) in 1989, the Board of Directors and all CCWC supporters have worked hard to ensure the Castle area remains wild. CCWC’s vision – a world in which wilderness survives so that wildlands and wildlife may thrive and future generations can know their natural beauty and diversity – remains integral to our purpose and keeps us focussed on advocacy and stewardship. The annual State of the Castle report is a snapshot of CCWC’s recent activities and observations in the Castle. There are both encouraging and discouraging remarks. CCWC is delighted with the recent designations of the Castle Provincial Park and Castle Wildland Provincial Park, but we are acutely aware that it is our responsibility to ensure wilderness values are upheld under this new legislation. 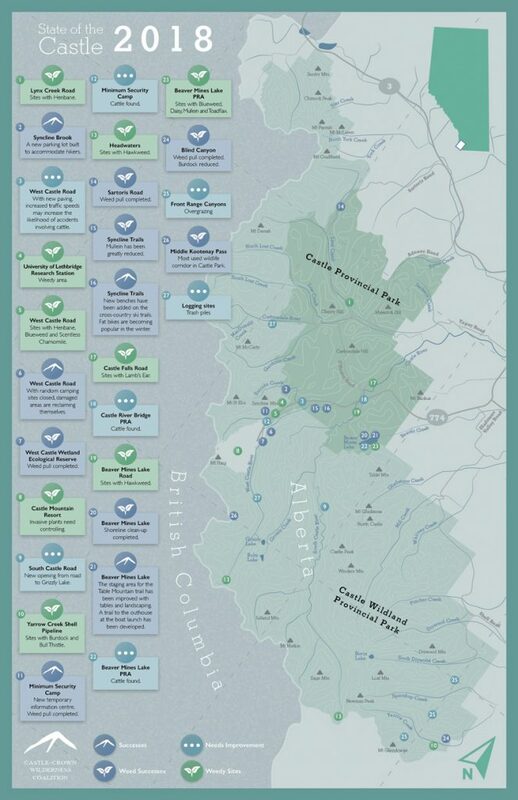 The CCWC Board of Directors and all coalition members would like to thank the Government of Alberta for moving quickly to commit to “fully protect” the area.We thank the many volunteers and conservation partners who participated in numerous stakeholder meetings, consultations, interviews andfocus groups. During this period for input, the advocacy work intensified while we continued our on-the-groundwork of clearing out trash, pulling weeds and reporting what we saw through the hiking program. We also acknowledge the scientists, local residents, conservationists, authors and recreationists who have been telling the story of stewardship for the Castle wilderness for 50 years.This dedication and the goal of protection never wavered, even as abusive responses and threatening actions mounted. We kept our vision paramount and remained focused, patient and disciplined. Download the 2018 State of the Castle report. Download the 2018 State of the Castle map.